Does She Belong To You? Around Town, Home, Latest News, Police & Fire, Today's Events Comments Off on Does She Belong To You? If anyone knows of anyone missing a white, female pitmix in the Woodbridge/Orange area. This girl was found Sunday night (around 8 p.m.) on the side of Dogwood Road. She wasn’t hit, but was very nervous and doesn’t have any tags. She can now be found at the Milford Animal Control. Milford Animal Control is located at 664 E. Broadway, Milford. The phone number is 203-783-3279. The Facility is open Monday – Friday: 9:00 a.m. to 5:00 p.m., Saturday: 11:00 a.m. to 3:00 p.m.
Found Dog: Is She Yours? Around Town, Today's Events Comments Off on Found Dog: Is She Yours? A friend in Woodbridge forwarded this to me. She was found on a family’s stairs yesterday and taken in for the night. She is said to be well taken care of, fed and friendly. She has since been brought to the District Animal Control, 135 Bradley Rd, Woodbridge. Look At That Face: Does He Belong To You? Around Town, Home, Latest News, Police & Fire Comments Off on Look At That Face: Does He Belong To You? 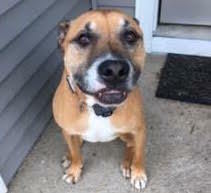 Milford-Orange Animal Control is looking to return him to his owner. He stopped his car and rushed to the dog’s side, moments later, an Orange resident on his way to work also stopped and helped get the dog out of the street. They notified the Orange Police, who then called the Milford-Orange Animal Control in Milford, which took custody of the dog. When Orange Live followed up with Lead Animal Control Officer Rick George, he verified that the dog, a bullmastiff, had indeed been hit by a car and suffered a spinal injury. He was treated by a veterinarian and is now on the mend. ACO George said he is looking for the owner of the dog. He appears to have been well taken care of and healthy before the accident and wants to return him to his rightful owner. The Milford-Orange Animal Control is at 664 E Broadway, Milford. If you know this dog, call 203-783-3279. FYI: The main thing that everyone needs to know is that the dog is in a safe, warm place and is receiving the care and attention he needs until his owner can be located.